Bernie Webber was the modern day superman in February 1952 when one of the worst storms had hit America. 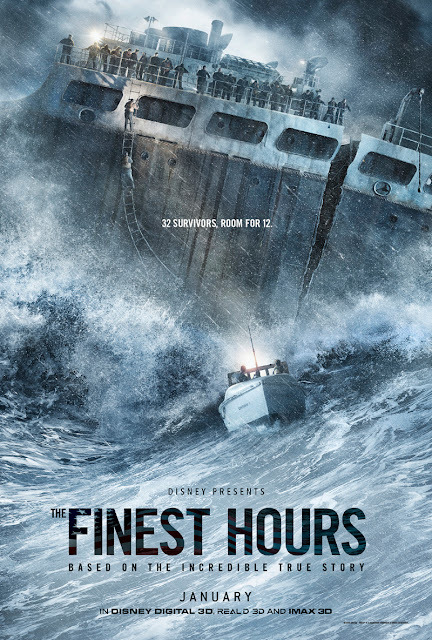 The Finest Hours is a historical drama film that is based on one of the most dangerous true rescue stories. Bernie played by Chris Pine is a member of the U.S Coast Guard who is assigned by his captain to go on a mission to save 32 men that were on an oil tanker shop split into two due to the storm. This duty might be his most fatal as he won't be risking his own life only but also the life of his fiancee Miriam (Holliday Grainger) who will do everything in her power to make sure her future husband returns safely so she can marry him. The movie is very well executed concerning the special effects! They could have worked better with the plot when it comes to the love story that was kind of unnecessary and passed very quickly in the movie.